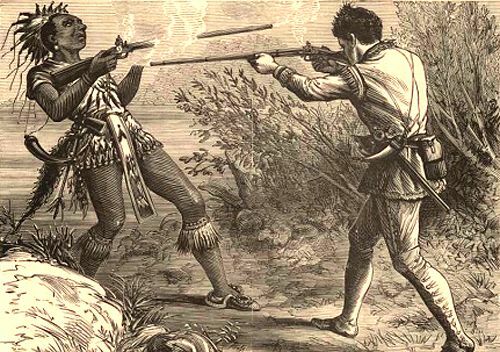 The Wabanaki Confederacy consisted of several northeastern Algonquian-speaking tribal nations. 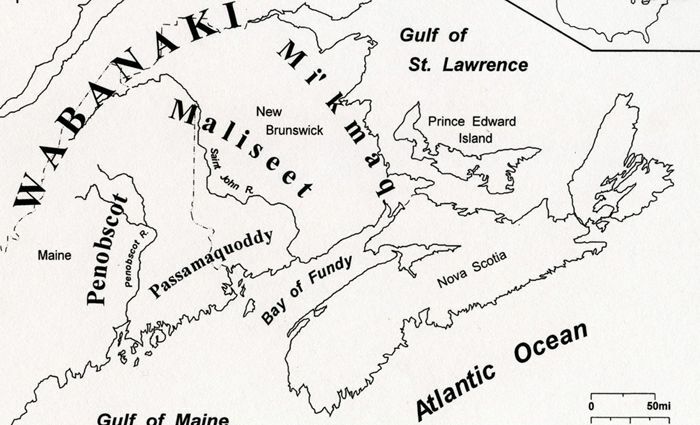 The five principal tribes were the Mi’kmaq, Maliseet, Passamaquoddy, Abenaki, and Penobscot. The name roughly translates as “People of the First Light” or “People of the Dawnland.” The tribes formed the Confederacy after increasing raids by their ancient Iroquois enemies. They primarily lived in an area they called Wabanahkik (“Dawnland”), which was known to European settlers as Acadia. These ancestral homelands stretched from Newfoundland, Canada to the Merrimack River Valley in New Hampshire and Massachusetts. When Europeans first arrived on the shores of Northeast America, they encountered several large alliances, some even crossing cultural or language boundaries. Early on, the French forged ties of friendship with the Algonquian tribes inhabiting the northern Atlantic seaboard. Within decades of their first encounters with Europeans, the tribes’ population was severely reduced by diseases and inter-tribal conflicts. The British declared the Wabanaki Confederacy forcibly disbanded in 1862 (present day Canada). However the five Wabanaki nations still exist, continue to meet, and the Confederacy was formally re-established in 1993.